Best, Worst, WeirdestBest, Worst, Weirdest focuses on three installments of a long-running video game series to explore its strengths, its failings, and where it got lost. Given the series’ history and its breadth of characters, settings, and storytelling motifs, you’d think the X-Men are an essential video game subject, but that’s not the case. X-Men’s greatest characters and themes are born of serialization. Ensembles require more room to run, and when they’re as oceanic in reach as the X-Men, more space than usual is required. From their start in the 1960s, X-Men was already dealing with a sizable crew—six protagonists and a stable of villains—but by their heyday in the ’80s and ’90s, there were dozens and dozens of mutants, aliens, cyborgs, and creatures from alternate dimensions populating the universe. All of them were utilized to tell stories that ranged from young people trying to come to terms with their bodies to what it means to be a responsible citizen of a populated galaxy. This is, in part, why the movies have never felt like a fulfilling extension of the comic universe built by Chris Claremont in the ’70s and ’80s. Those comics, and the ongoing cartoons they spawned, have the space they need. We can follow a long saga about Cyclops trying to build a family after years of conflict and loss because there’s room for those stories in a monthly issue or a weekly episode. We can get to know the minutiae of strange cultures, such as the birdlike Shi’ar Empire or the underground Morlocks, and because the core cast is your anchor throughout that exploration process, the characters become even more potent. Colossus can die after surviving years of conflict, be mourned over more years, and when he’s finally resurrected, like in Joss Whedon’s Astonishing X-Men, the sight of him in his original costume is enough to elicit overwhelming emotions. X-Men is a bizarre pop-culture phenomenon because its success comes from having iconic characters with striking, simple characteristics, but their history is complex and wide. Perfect for comics, episodic television, and even multimedia tie-ins building on that mythology; not so great for media that has to stand alone. Video games are roomier than movies, but they are similarly isolated. That may be why there aren’t very many X-Men games at all, and the ones that do exist struggle to capture the essence of the series. Most of the X-Men video game history demonstrates precisely why that lore is a detriment to video game making. Specificity and clarity are a game designer’s best friends. When you’re trying to adapt a universe that started with small tales about “the world’s strangest teenagers” and currently involves an intergalactic, time-traveling endangered species whose home base is in Limbo, there is no good place to start. A successful X-Men video game, then, is one that captures the look and feel of a good swath of those characters, leverages the history of the series to make an entertaining scenario, and if everything goes perfectly, maybe there’s some room to get into the themes that are so rich in the source material. 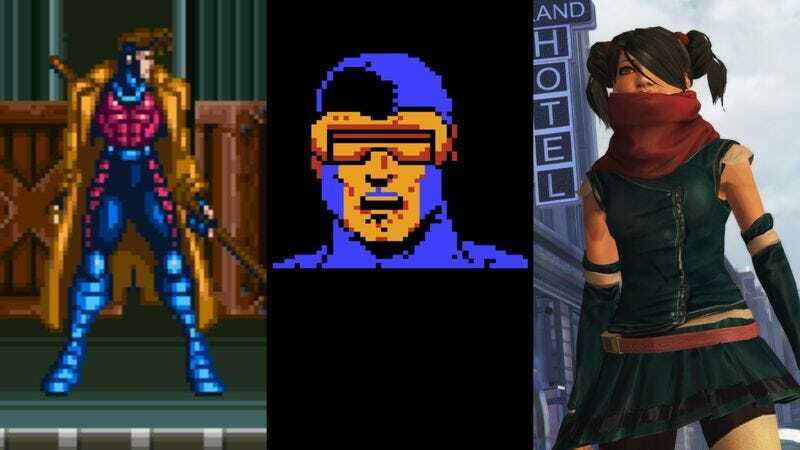 Unfortunately, no X-Men game has ever managed all three, but one at least nailed the first two. We can’t blame the majority of X-Men games for being about punching things. Even at their most philosophical, X-Men comics are still about people punching people. Sometimes it’s a firebird who is the physical embodiment of universal rebirth punching an evil living aerosol can in the post-apocalyptic future, but it’s still punching. Capcom’s X-Men: Mutant Apocalypse isn’t a perfect game by any means, but it is the game that best balances everything that X-Men is. Its great victories are accuracy and breadth. In a very compact space, it fits in an enormous chunk of the authentic X-Men world, all of it recognizable and right. In half the lifetime of the X-Men, no one else has nailed that kind of blend again. A brawler where you play as the beloved X-Men Blue Team of the ’90s, Mutant Apocalypse is rife with weird characters, gorgeous art, killer tunes, and an array of distinctive mutant powers. When it came out in 1994, X-Men popularity was at a peak. The Blue Team refers to the lineup of characters in the then-new series just called X-Men, the first issue of which sold more than 7 million copies in 1991. (X-Men #1 remains the best selling single issue of a comic book ever.) Mutant Apocalypse starred Blue’s Wolverine, Psylocke, Gambit, Cyclops, and Beast. It’s a perfect lineup for the era, blending the popularity of the book and the Fox cartoon. Capcom’s bright sprite art bridges the gap between the animated series and artist Jim Lee’s now instantly recognizable take on the characters, and Mutant Apocalypse runs them through a gauntlet of almost all the major threats the X-Men had been dealing with over the decade preceding the game: the mutant prison-turned-sanctuary Genosha; the parasitic Brood aliens; immortal mutant tyrant Apocalypse; villain Omega Red; and especially the terrorist-like incarnation of Magneto and his acolytes. Mutant Apocalypse doesn’t take the time to get into what this huge chunk of the X-Men world means, but it does its absolute damnedest to show it all. It couldn’t welcome in new fans by any means, but the faithful got a game that comes very close to covering the breadth offered in the comics and one that plays well to boot. Did X-Men: Mutant Apocalypse have a good story? Beyond some expository text from Chuck Xavier, there’s no story at all. Does the action have the quality and depth of Children Of The Atom or X-Men Vs. Street Fighter, Capcom’s proper (and spectacular) X-Men fighting games from the mid-’90s? The characters are stiff and awkward by comparison. It doesn’t even hold a visual candle to Konami’s famous 6-player arcade entry, but those games don’t have nearly the depth of authentically wrought X-Men minutiae that Mutant Apocalypse does. If it somehow had cutscenes where Scott Summers moaned about his legacy and Beast could monologue about the ethics of using violence to combat oppression, it would be perfect. Superficially similar to Capcom’s Commando, you view the action from overhead. At the start of its six stages, you pick from some of the ’80s’ most famous X-Men—Wolverine, Storm, Colossus, Nightcrawler—as well as older holdouts Iceman and Cyclops. In each stage, you guide them from the bottom of the screen to the top over what appear to be wrecked highways and ugly bathroom floors where they have to fight bouncy spiders and possessed Slinkies. Each character has an attack that barely affects enemies if you can make it land. They also have a special mutant ability attack that will kill them if they use it. Yes, using Wolverine’s claws, the genetic mutation he can survive because of an innate capacity to heal quickly, will kill him if he uses them in The Uncanny X-Men. The tragedy of Uncanny isn’t that it’s an abomination, it’s that it doesn’t manage to tap into the soul of its property in the way that the NES’, and specifically LJN’s, bizarre licensed games could. LJN and its stable of contract developers made games that were almost exclusively bad, but many of them came up with novel ways to translate source material from other media. As miserable as it is to play, Friday The 13th nails the sense of constant foreboding and campy ghost-house terror from the movies. The same goes for Jaws, a brief and strange blend of underwater shooting, shark hunting, and boat-building that isn’t fun but does bottle the eerie feeling of heading out to sea to destroy a mysterious monster. Uncanny X-Men, meanwhile, does nothing beneath its badness to even nod toward the mutant mythos. Why not frame the industrial and swamp stages as missions to the Shi’ar Empire to save Jean Grey during the Dark Phoenix saga? Or claim that these nondescript springs and spiders are miniature Sentinel robots designed by Henry Gyrich to hunt down mutants? It’s the inversion of Mutant Apocalypse’s success. Where Capcom leveraged the ingredients of long-form X-Men stories to make for a great, if small, game, LJN’s didn’t even make a perfunctory effort to place its poorly wrought characters into a conceptual framework that felt right, as it did with its other games of the era. In that regard, its failure is not dissimilar to Silicon Knights’ with X-Men Destiny. That game could have been an excellent X-Men adaptation, but its approach to the material drifted too far from authenticity and, more importantly, the very core of X-Men’s identity. Some might accuse X-Men: Destiny of being absolute garbage as well. It’s certainly not good. The dull-eyed golems masquerading as White Queen, Quicksilver, and other characters in this action game emote with the same grace as a Russian chatbot scamming for credit card numbers on Skype. The levels look like they’ve been cobbled together using leftover debris from a dozen canceled games, a mishmash of ruined city streets, sewers, and dark concrete hallways that look poor even for scraps. But Destiny isn’t a truly bad game, either. The bizarre presentation and ramshackle action feel unfinished more than anything else, the bones of a more ambitious work that somehow slipped onto shelves years before it would have actually been completed. Look close, though, and beneath its endless array of flaws you can see the odd game Silicon Knights at one point planned on making. Unlike other X-Men games, Destiny has you pick a new character that you customize over time. This is an excellent premise. Since the 1980s and the creation of characters like Kitty Pryde and the cast of The New Mutants, many of the best X-Men stories have been explorations of teenage identity. (Xavier’s original team were teens, too, but they were about as realistic as the cast of Cruel Intentions and the complete opposite when it comes to sexual curiosity.) Basing a game around a pubescent force of nature finding their superpowers as they find themselves is a good recipe for capturing an essential X-Men feeling. It’s also a good opportunity to surround the player with iconic characters without over-emphasizing any one in particular by forcing you to control them for long periods of time. In practice, though, Destiny just feels off. There are only three characters options: Aimee, who looks like a model from the Hot Topic fall 2004 catalog; Adrian, who looks like an Uncharted cosplayer; and Grant, the college football player who looks like he’s made of spray-painted cardboard boxes. Their mutant abilities, meanwhile, are left for you to customize by collecting items throughout the stages and using them, alongside costumes from actual X-Men characters, to grow your powers around offensive, defensive, and support abilities. Step away from the quality issues plaguing X-Men: Destiny and consider how odd this sort of character creation is in the larger context of the mutant world. Part of the reason coming-of-age stories are so potent in X-Men media is that they’re primarily concerned with change you can’t control. Not only might a young mutant have funny feelings for Ashley in homeroom, he now has leaves sprouting out of his 2-foot-long eye stalks. That’s a lot of guidance counselor sessions right there. Letting players choose how those powers manifest prevents Destiny from embracing the sort of struggles that would make for a classic. X-Men Destiny is a weird, famously incomplete game about punching things that actually has ingredients to become the perfect X-Men game. Blend in the same attention to detail Mutant Apocalypse achieved while also reconsidering its approach to player choice and there would have been something here. Rather than the awkward combination of X-Men cosplay and light character building that was actually in the game, your character’s abilities would have to be fixed from the start and the scenarios you faced would force you to think about how you use them. Do I use my new water-hose legs to put out a fire started by Pyro? Do I use them to assault a band of humans who harvest mutant bodies and try to steal their powers? Or do I use them as a pacifist horticulturalist on a plot of land back on Genosha, gardening my way to a better world? That’s the perfect X-Men game, after all: some kind of intensely diverse life simulator that can successfully bottle 50 years of continuity and art, then let you explore it all from a nearly infinite variety of narrative perspectives. That is, of course, an impossible video game to make.